+ book review & everything about books. Published Date: 1st of September 2015. Published By: Delacorte Books for Young Readers. Category: Fiction / Contemporary / Young Adult / Romance. This review is so overdue, I read it a few weeks ago. 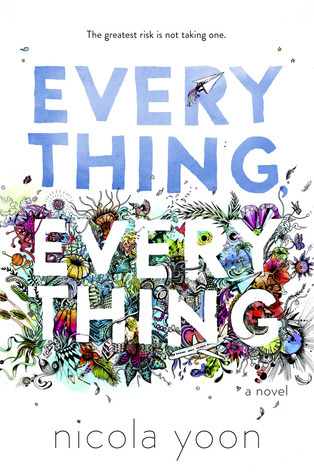 I found Everything, Everything such an easy read, It didn’t take me long to finish it at all. It only took me a couple of days to finish it. Everything, Everything has over 30 thousand reviews! Since this book has so many reviews, I will try my best to keep this short. I will be stating what I liked and what I did not like about it rather than doing a full review. Everything, Everything is about a young girl named Madeline Whittier who is very sick, she has SCID, it is a rare disease which means she is allergic to everything. She has not left her house for seventeen years or she will die. She is only allowed to see two people, which are her mother and her full time nurse Carla. But one day everything changed when a new family moved in next door. Everything, Everything was written really great. I was worried a little bit that I might not like it at all but I felt completely the opposite. I love the story and how the book style was amazing and really cute. Even the pictures that are in the book were also really good. The characters were amazing, It was definitely created really well. I love that there was a little bit of a mystery in this book, which I did not expected! I thought it was just a typical romance story of a boy and a girl who fell in love but they can’t be together and that sort of stuff. Having the mystery part made the story better and I loved it. Madeline Whittier is definitely my favourite character. She is sweet and kind eighteen year old girl. I can’t believe she never left her house for seventeen years! If this was me, I would have totally just gone outside just for the sake of it. I really thought she was a strong girl. She kept herself busy, of course you had to or you’d go crazy for being inside the house for so many years. Olly is my other favourite character. At first I really thought he was one of those typical hot bad boy next door but he was definitely completely the opposite of that. He was sweet, gentle and just generally a nice guy. Overall, The book, the characters, the romance, the mystery and literally everything, everything was amazing. The book was an easy read, I highly recommend it to anyone, especially to people that are fan of YA and contemporary romance books. I really thought Nicola Yoon did an amazing job writing this book. I can’t wait to read her other book “The Sun Is Also a Star“. Nicola Yoon grew up in Jamaica and Brooklyn (part of Long Island). She currently resides in Los Angeles, CA with her husband and daughter, both of whom she loves beyond all reason. Everything, Everything is her first novel. If you would like to know more about Nicola Yoon and other books she have written check out her twitter, visit her website, instagram and her goodreads profile. hello & welcome to my bookish blog. i’m Abby and i’m from melbourne australia. i enjoy long road trips, listening to music and of course BOOOKS! It’s Monday, What Are You Reading?